5/14 Cup of Coffee: The arms and bats were on display in a couple of impressive wins for the affiliates Friday. Justin Haley (pictured) tossed a shutout in a walk-off win for Portland, while Josh Ockimey once again powered Greenville to victory. Travis Lakins struggled in a blowout loss for Salem. Pawtucket’s game against Gwinnet was rained out, so the pair will play a doubleheader Saturday. Game one will start at 4:35 pm and feature Eduardo Rodriguez in his fourth rehab start. For seven innings Friday, the Binghamton Mets had no answer for Justin Haley. The tall right-hander took advantage of the front end of a doubleheader to pitch a seven-inning complete-game shutout. He allowed one hit and struck out five. The Sea Dogs' bats waited until the last inning to back up Haley’s gem. Henry Ramos led off the bottom of the seventh with a single and moved to third on a base hit and sacrifice bunt. With one out, Nate Freiman’s infield single ended the game in walk-off fashion. Freiman went 1 for 3 in his second game since signing with the Red Sox. Ramos had a pair of hits out of the leadoff spot and made a terrific catch crashing into the center field wall to end the fourth inning. The nightcap of the doubleheader was rained out and has been rescheduled to Saturday at 1 pm. Travis Lakins’ ERA jumped almost a run and a half Friday after the Blue Rocks roughed him up for two runs in the first, three in the second, and two more in the fourth. 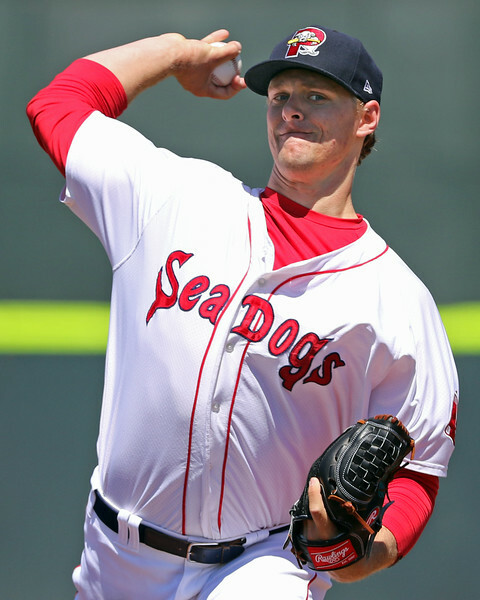 Wilmington kept pounding away on Salem reliever Jamie Callahan before Yankory Pimentel shut the door with three scoreless innings. Nick Longhi, Rafael Devers and Mike Meyers each went 2 for 4 in the middle of the Salem lineup, with Longhi and Meyers driving in two runs apiece. However, the rest of the lineup managed just two hits; a Yoan Moncada double and a Mauricio Dubon single. After a slow start, Greenville’s bats caught fire in a 7-2 dispatching of the GreenJackets. Luis Alejandro Basabe drove home the game’s first run with a double in the fifth. Tate Matheny knocked him in with a triple, and Josh Ockimey made it 3-0 with a double. The Drive ran away with the game with two-run frames in the eighth and ninth, both of which featured RBI hits by the red-hot Ockimey. Greenville starter Logan Boyd held Augusta in check for six innings, limiting the scoring to a two-run single in the fifth while striking out four. In addition to Ockimey’s 3-for-5 night, the Basabe brothers, Luis Alejandro and Luis Alexander, each drove in a run and reached base three time. Matheny’s triple was his third of the season and part of a two-hit, two-run night for the outfielder. Player of the Night: Even in a shortened game, Justin Haley’s one-hit shutout takes the affiliate cake Friday. After consecutive scoreless, seven-inning starts, Haley’s scoreless inning streak is up to 18, while his ERA is down to 1.93. After getting roughed up in Portland in 2015, Haley has adjusted to Double-A in 2016, allowing two or fewer runs in seven of eight starts and never allowing more than three.